Emory employees Bridget and Tommy Burke met at the Chair Rodeo, helping set up for Commencement. 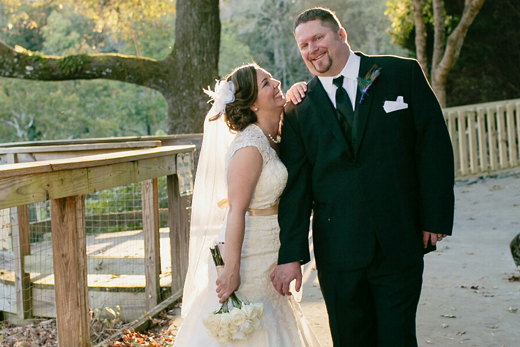 After a proposal on the Quad, they were married Oct. 17, 2014. Photo by Barbara Covington. The Chair Rodeo is set for Wednesday, May 6, from 9 a.m. until noon. To volunteer for the rodeo or to help at Commencement, May 11, sign up online. The first time Bridget Burke volunteered to join Emory co-workers to set up chairs at the university's annual Commencement Chair Rodeo, she wasn't looking to lasso a husband. Burke, who at that time worked for Emory's Transportation and Parking Services, knew only that the goal of the annual event was to help assemble and arrange a sea of folding chairs on the Emory Quadrangle for thousands of anticipated guests. She had no idea that in addition to some 14,000 chairs, what would also unfold that day was the beginning of a love story. But when Facilities Management heavy equipment operator Tommy Burke stopped by to thank Bridget (then Lombardi) and her friends for taking the time to help with the community effort, she gazed into those blue eyes and felt a spark. "I told my co-workers that I liked this guy," recalls Bridget, who now works as an administrative assistant for the Wound, Ostomy and Continence Nursing Education Center (WOCNEC) with the Nell Hodgson Woodruff School of Nursing. "He looked like a big lumberjack," she says. "I was definitely interested." When the Chair Rodeo rolled around the following year, she returned to volunteer — for the fun and camaraderie, to meet new people and contribute to the campus community, yes. But also for the chance to see a certain blue-eyed Campus Services employee. For three years that's how it went — they would greet each other at the rodeo, talk and laugh. Each year, there was that undeniable spark. Until the day her co-workers finally took matters into their own hands. Borrowing a page from the middle school playbook, they cornered Tommy at the barbecue held for volunteers following the Chair Rodeo, a task that takes about three hours to complete. "They asked him straight up if he had a girlfriend," Bridget recalls, laughing. "I was pretty mortified, but I guess he just needed someone to slap him upside the head." Tommy certainly had noticed the spirited girl with the megawatt smile and long brown hair. But when it came to matters of the heart, "I'm actually pretty shy," he admits. A friend and co-worker finally intervened: "Dude, she likes you. If you don't ask her out, you're crazy." Tommy Burke may be a lot of things, but he's not crazy. A week later, he created a Facebook account and was messaging Bridget. "I was so excited," she recalled. "I had already tried to find him on Facebook, too." Working at the permits counter one day, Bridget was surprised to look up and find Tommy waiting to apply for a permit. "If you help me out with this, I'll take you to lunch," he offered. Needless to say, he got some help that day. Three years later, Tommy and Bridget found themselves on a date that included an early evening stroll around the Emory Quadrangle. It was dusk, the weekend following Emory's Commencement. Though the folding chairs were long gone, the stage was still standing. Holding her hand, Tommy led Bridget up the stairs. He described that first time they met during the Chair Rodeo —and the many Chair Rodeos that would follow. As Bridget stood on the very spot where Emory graduates receive their diplomas, Tommy dropped to one knee and proposed. Last fall, they were married. This year, they will be back on the Quad helping with Emory's 2015 Chair Rodeo — a monumental task made easier by volunteers from all over campus who come together to help prepare for a special moment in the lives of Emory graduates. For the Burkes, it will also be a special moment — an anniversary of sorts. "Both his mother and father worked here, so we're an Emory legacy now," laughs Bridget. "We love the Emory campus, we both really enjoy being there. And doing this will always bring back memories."